Balancing a bank account is remarkably easy in QuickBooks. In fact, if you have any problems, they probably stem from … well, sloppy record-keeping that preceded your use of QuickBooks. In a reconciliation, as you probably know, you compare your records of a bank account with the bank’s records of the same account. You should be able to explain any difference between the two accounts — usually by pointing to checks you wrote which haven’t yet cleared. Choose Banking→Reconcile or click the Reconcile icon on the Home screen. QuickBooks displays the Begin Reconciliation dialog box. If you have several bank accounts, you may have to select which account you want to reconcile. If the bank account shown isn’t the one you want to reconcile, open the Account list and choose the correct account. Enter the bank statement date into the Statement Date text box. You can adjust a date one day at a time by using the plus (+) and minus (–) keys. You can also click the Calendar button on the right side of the Statement Date text box to select a date from the calendar. Verify the bank statement opening balance. QuickBooks displays an amount in the Beginning Balance text box. Enter the ending balance from your bank statement into the Ending Balance text box. Enter the bank’s service charge. If the bank statement shows a service charge and you haven’t already entered it, move the cursor to the Service Charge text box and type the amount. Enter a transaction date for the service charge transaction. QuickBooks adds one month to the service charge date from the last time you reconciled. If this date isn’t correct, type the correct one. Assign the bank’s service charge to an account. Enter the expense account to which you assign bank service charges in the first Account text box — the one beside the Date text box. Activate the drop-down list by clicking the down arrow, highlight the category by using the arrow keys, and then press Enter. Enter the account’s interest income. If the account earned interest for the month and you haven’t already entered this figure, type an amount in the Interest Earned text box. Enter a transaction date for the interest income transaction. Assign the interest to an account. In the second Account text box, enter the account to which this account’s interest should be assigned. QuickBooks displays the Reconcile window. Identify the first deposit that has cleared. Mark the first cleared deposit as cleared. Scroll through the transactions listed in the Deposits and Other Credits section of the Reconcile window, find the deposit, and then click it. You also can highlight the deposit by using the Tab or arrow keys and then pressing the spacebar. QuickBooks places a check mark in front of the deposit to mark it as cleared and updates the cleared statement balance. Record any cleared but missing deposits. If you can’t find a deposit in the Reconcile window, you haven’t entered it into the register yet. Close or deactivate the Reconcile window by clicking the Leave button. Now open the register and enter the deposit in the register in the usual way. To return to the Reconcile window, either reopen it or reactivate it. Or you can just choose Banking→Make Deposits and open the deposit screen right on top of the Reconcile window, if you like. Record the deposit and then click the Save & Close button. When you open the Reconcile window again, the deposit appears in the Deposits and Other Credits area. Repeat Steps 1–3 for all deposits listed on the bank statement. Make sure that the dates match and that the amounts of the deposits are correct. If they’re not, go back to the transactions and correct them. To get to a transaction, click the Go To button. You see the Write Checks or Make Deposits window where the transaction was originally recorded. Make the corrections there and then click Save & Close. Identify the first check that has cleared. Just find the first check or withdrawal listed on the bank statement. 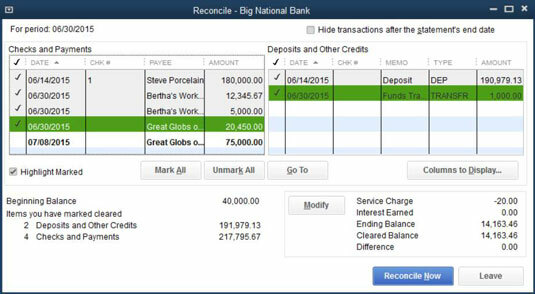 QuickBooks enables you to sort the transactions listed on the Reconcile window by clicking the column headings in the Checks and Payments section and in the Deposits and Other Credits section. Mark the first cleared check as cleared. Scroll through the transactions listed in the Checks and Payments section of the Reconcile window; find the first check; and then click it. You also can highlight it by pressing Tab and an arrow key. Then press the spacebar. QuickBooks inserts a check mark to label this transaction as cleared and updates the cleared statement balance. Record any missing but cleared checks. If you can’t find a check or withdrawal in QuickBooks, guess what? You haven’t entered it in the register yet. Close or deactivate the Reconcile window by clicking its Leave button or by activating another window. Then display the register and enter the check or withdrawal. To return to the Reconcile window, reopen or reactivate it. Or you can just choose Banking→Write Checks, create the check right on top of the Reconcile window, and then click Save & Close to return to the Reconcile screen and carry on from where you left off. Repeat Steps 5–7 for all withdrawals listed on the bank statement.